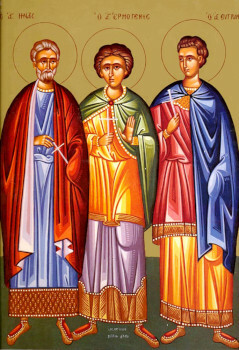 Science of the Saints, 23-XII-2018 (10 Dec.), The Holy Martyrs Menas, Hermogenes, and Eugraphus. Saint Menas was sent by the emperor from Athens to Alexandria to suppress the riots that had arisen between the Christians and the pagans. Distinguished for his gift of eloquence, Menas instead openly began to preach the Christian faith and he converted many pagans to Christ. Learning of this, Maximian dispatched Hermogenes to the Alexandria district to conduct a trial over the saints, and moreover was given orders to purge the city of Christians. Hermogenes, although he was a pagan, was distinguished however by his reverent bearing. And struck by the endurance of Saint Menas under torture and by his miraculous healing after the cruel torments, he also came to believe in Christ. Maximian himself then arrived in Alexandria. Neither the astonishing stoic endurance under torture of Saints Menas and Hermogenes, nor even the miracles of these days manifest of God in this city, in any way mollified the emperor, but instead vexed him all the more. The emperor personally stabbed Saint Eugraphus, the secretary of Saint Menas, and then gave orders to behead the holy Martyrs Menas and Hermogenes. The remains of the holy martyrs, cast into the sea in an iron chest, were afterwards found and transferred to Constantinople. The emperor Justinian built a church in the name of the holy Martyr Menas of Alexandria. Saint Joseph the Melodist composed a canon in honour of the holy martyrs.